After experiencing so many things in one short week, one experience has stuck with me and created some conflicting feelings within me. The day I am talking about is our visit to the Mae Sa Elephant camp. I was excited when we arrived to the camp because I had never seen an Elephant close up before, besides the zoo. I had preconceived notions of what to expect as far treatment towards the elephants. 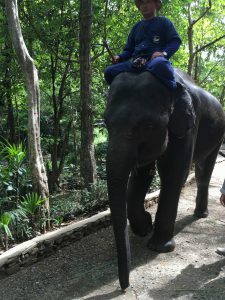 We had talked as a group before the outing about how it is inhumane to “ride” the elephants. I was under the impression that this camp did not take part in that. After seeing this taking place I was questioning the treatment of the elephants. I also had conflicting feelings because I was enjoying the time we got to spend with the elephants and realizing how lucky I was to get the chance to be that close to such a beautiful animal. For the most part, I think the treatment between the mahoot and the elephant was very gentle and warm. The mahoot grows with the elephant and they create a special bond together. They also took very good care of them as far as feeding them and bathing them. I liked being able to see them in the river because the mahoot bathed and scrubbed the elephant. They also were able to communicate with the elephants. It was amazing to see how smart the elephants were and what they understood. This helped ease some of the conflictions I was having during the outing. However, it was very hard for me to know how to feel about the elephant show. The elephants were able to do so many things, but I kept thinking about them in the wild and how they would never be painting a picture. I remember feeling upset when the elephant closest to us was the last one there and his mahoot kept making him do more. I kept thinking that he had already done so much, and was one of the younger elephants. I also thought the whole experience was created for tourist. The whole day was surrounded around visitors and catering to them. The elephants knew how to pose, the show was put on to make people clap and pay money, sugarcane and bananas were provided for a price, even the “bath time” was scheduled so that people could watch. Again, all very unique and once in a lifetime experiences, but also not very realistic. I guess one could argue that any “elephant camp” would not be considered realistic, especially with a lense of wild elephants in your mind. Overall, I am still not sure how I felt about it. 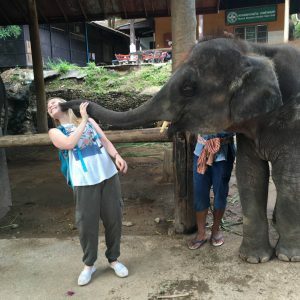 I loved the experience and took pictures with the elephants like a tourist, but I left feeling unsettled about my prior knowledge to this experience.